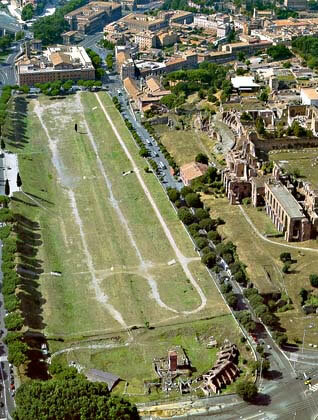 The History Blog » Blog Archive » Chariot racing revival in Rome? This entry was posted on Tuesday, July 15th, 2008 at 10:06 PM	and is filed under Roma, Caput Mundi. You can follow any responses to this entry through the RSS 2.0 feed. You can skip to the end and leave a response. Pinging is currently not allowed. Sweet!!! I hope they go for it. Rome thrives off of tourism and this will certainly draw more. Hope I get to visit Italy some day. I love history and your blog is very informative. I am stoked I stumbled upon it. Keep up the great work. Thank you so much for the kind words. I hope you get to visit Italy soon, maybe even when the chariot races are on. yeass yess yes yes i love this i made a small repreca!i lovee you! it even had charoits! yeeeww doogieegayys!what i woulderful ideal im visting rome next week i cant wait! its gona be soo fun! woahh buday what in darnations is that “emo”kid talking about did he even read this blog? ?thats imamature have some sences people! Damn, I thought this thingie saved my comments identity info. Anyway, as I said elsewhere, some people work in spam the way other artists work in oil paint or clay. And NO, I CAN’T type a proper URL to save my life. Stop judging me. aint nuthin sadder than a glare smilie that don’t glare. Its like impotent in its fury. Jess in case case you didn’t realize it. Buncha smartasses up in here. What in damnation kind of replies did this post garner? What in the world did you do? I see nothing particularly unusual about this post compared to most of the others you have created. But the replies sure are….unusual. Must have been a keyword somewhere that you used that attracted random people from Google. Gotta love the internet!